Welcome to Day #5 of Chocolate and Dark Blend Bars Theme Week. Today we push the edge of the envelope for what's considered dark chocolate with this Soleil d' Automne 45% Cacao (Blend No. 30) bar from Guittard (Burlingame, CA). Technically, 45% can still be considered dark chocolate, although perhaps "dark milk" might be a better description. If you like milk chocolate, this dark milk bar (part of a line of Guittard blend bars with cacao % content ranging from 30% to 100%) might be to your liking. Today's bar had a pleasant milk chocolate aroma with a hint of toffee popcorn. This chocolate managed to be creamy and sweet (without being overwhelmingly so) and had more authentic fine chocolate flavor than many other similar lower percent dark milk bars*. Tasting notes listed on the packaging read: "Milk chocolate with notes of caramel apple and creme fraiche dairy." 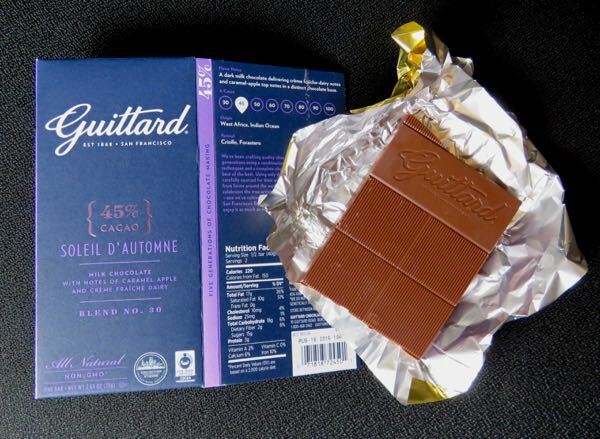 This Guittard bar was made with a blend of Criollo and Forastero varieties of cocoa beans that were grown in West Africa and Indian Ocean regions. *Many popular, high-volume commercial milk chocolate bars contain less than 15% cocoa solids.